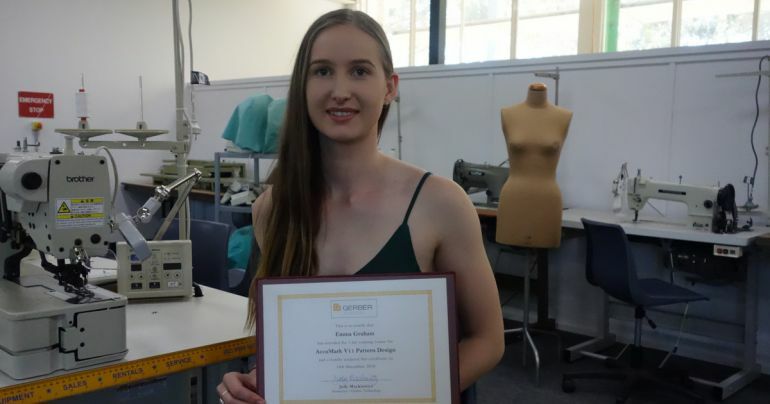 CIT Fashion Design graduate Emma Graham got closer to her dream of becoming a patternmaker for an established label as she recently won the Gerber Technology Award. Technology is taking the fashion industry to a new level. Designers may still choose to sketch designs and make patterns by hand, but through computer-aided (CAD) programs, patternmaking is more efficient and effectively performed. Valued at $5,000, the award gave Emma the opportunity to travel to Sydney for a five-day course to learn in detail the functions of the Gerber digital patternmaking software, which most companies use in the industry. Emma has been strongly encouraged to pursue her dream career in fashion. "My Nan taught me to sew and together we bought my first sewing machine when I was in primary school - I was hooked," Emma said. She continued to sew in high school where her textiles teacher opened her eyes to a world that she had never thought could be anything more than a hobby and encouraged her to dream big and make it happen. Emma's creative process includes research, collecting imagery and lots of sketching. CIT students work on developing both their artistic vision and technical skills to break into the competitive fashion industry. "I don't have enough kind words for all the staff within the fashion department at CIT. They were always willing to help, sharing a huge combined knowledge base and years of industry experience with us all, putting in a lot of hours of work to help us achieve our goals," Emma said. Canberra's theatre company Dramatic Productions will showcase Emma's talent. Emma has taken the lead as Costume Designer for Bakersville: A Sherlock Holmes Mystery creating 1890's period garments for the production running 19-27 April. Learn more about Fashion Design at CIT.